Octagon shaped bright grayish ship in sky, near Cameron Texas on highway 36. Blinking. Fast. Scary. I’m somewhat nervous to have to explain something of this nature. Never in a million years would I have thought it remotely possible in reality. Last night my son and I were driving on hwy 36 around 11:30 on our way to my mother’s house in Copperas Cove. In the distance we noticed a very bright flashing light. My first thought was that it could be a plane, helicopter or a signal tower with unusually bright lights. We continued to watch it when suddenly it was RIGHT ON ABOVE of our SUV! There are few words that will effectively relay to anyone that wasn’t there just how large and utterly surreal looking this thing was. It was shaped like an octagon with flashing lights on all sides. It looked like a building floating in the sky. It had debt/structure to it that’s hard to put into context. I was in shocked and as a mother I became fearful this thing could be a potential threat considering how close it was. So I stepped on the gas to get away from it. I was driving way over the speed limit and not looking back when it occurred to us to take a picture or video. My son was in the back filming what was left of it at that point. Both my son and I were just floored by what was happening. I’m extremely disappointed we didn’t think soon and capture the object in solid form. When we first saw the object it was about 400 meters above us, close enough for us to realize its enormous size, hexagonal shape, and its grey/concrete color. By the time my son had pulled out a camera and moved to the back of the vehicle to film, it appeared to have distanced itself substantially from us. NOTE: The above image is a rendering. Mr. Waring explains why NASA hides such information from the public. “Anything to do with aliens is instantly classified because it could pertain to national security.” He also sites a recent example of how NASA had hidden information from the public. “Remember the historical announcement a NASA scientist said was about to happen but never did last week. NASA lies.” Scott Waring further tells us how NASA is trying to avoid lying to the public. “And they are trying to avoid lying to the public by… not discussing the topic at all. SCW” We would like to remind our readers that in the recent past, there has been an increase in sightings of UFOs around the sun. 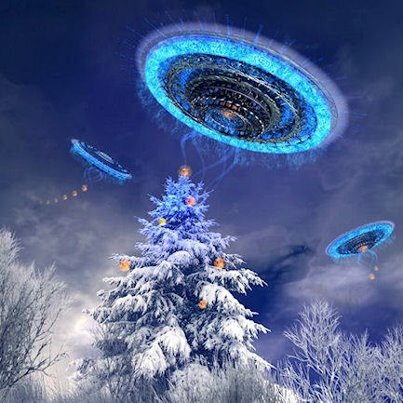 Earlier, some researchers had assumed that the occurrence of these Archontic entities could be linked to the end of the Mayan long Calendar on the 21 December 2012. However, as the day has already passed, we cannot be sure about the intention of these objects, and what they are doing around our sun. KENS NOTE: I have been logging this information for years. 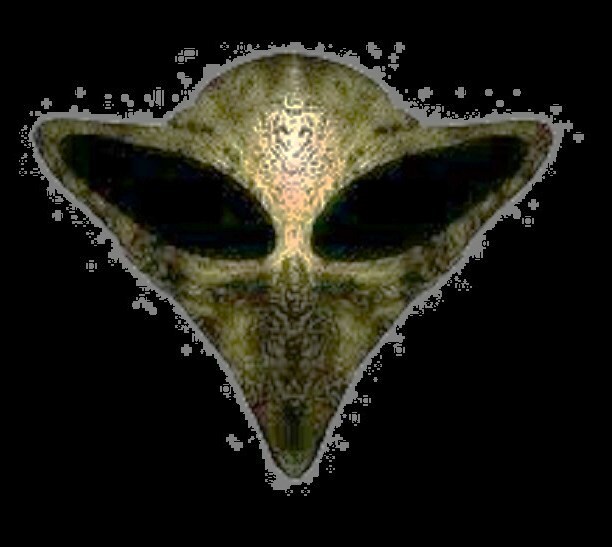 I have a special page for UFO’s and SUN on my web site. I feel these objects are getting their energy from the sun. 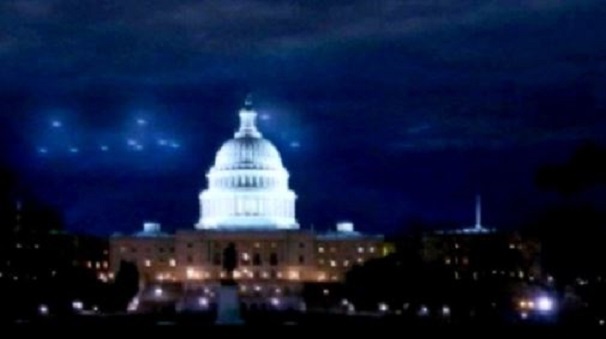 1952 UFO’S OVER WASHINGTON D.C. The sightings of July 19–20, 1952, made front-page headlines in newspapers around the nation. A typical example was the headline from the Cedar Rapids Gazette in Iowa. It read “SAUCERS SWARM OVER CAPITAL” in large black type. 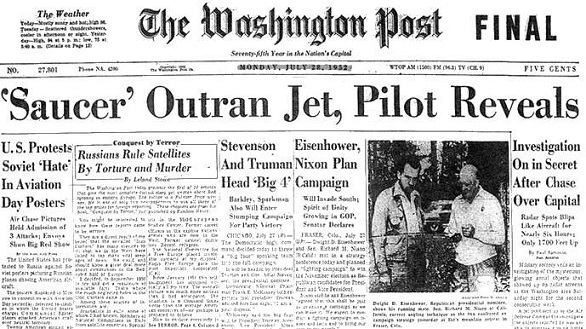 By coincidence, USAF Captain Edward J. Ruppelt, the supervisor of the Air Force’s Project Blue Book investigation into the UFO mystery, was in Washington at the time. However, he did not learn about the sightings until Tuesday, July 22, when he read the headlines in a Washington-area newspaper. After talking with intelligence officers at the Pentagon about the sightings, Ruppelt spent several hours trying to obtain a staff car to investigate the sightings, but was refused as only generals and senior colonels could use staff cars. He was told that he could rent a taxicab with his own money; by this point Ruppelt was so frustrated that he left Washington and flew back to Blue Book’s headquarters at Wright-Patterson AFB in Ohio (Ruppelt, 162). Before leaving Washington, Ruppelt did speak with an Air Force radar specialist, Captain Roy James, who felt that unusual weather conditions could have caused the unknown radar targets. 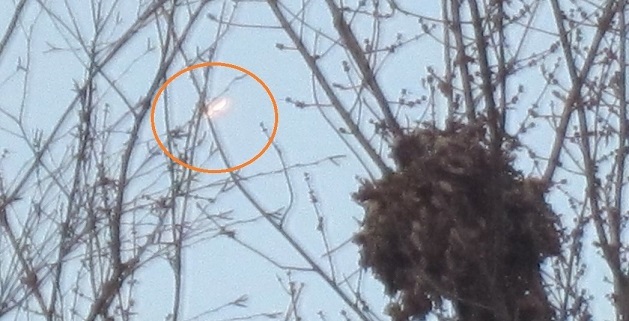 At first, I was outside when I noticed this really bright object above the horizon. I was at home in La Minerve (near Mont-Tremblant),in the province of Quebec, looking over the mountains on the other side of the lake facing our house (south east direction). The sky was very clear, I could see the moon and many stars since we are in a rural country. Looking at the light source, I noticed it was pulsating and changing colours very fast. The light was not moving so I was sure it could not be a plane or something similar. I came inside the house and told my spouse who was able to witness the object through our window facing the lake. The phenomena last for at least one hour, and probably longer as it was moving up in the sky very slowly like a star would move due to earth rotation. We thought it could be maybe Jupiter but when we took the binoculars (7 X 35) we saw how the light was transforming, expanding and contracting and changing colours. We dont believe Jupiter would be like this. Our attention was on the bigger source of light but we took several pictures and videos and noticed other smaller lights around the big one. The smaller lights were moving fast, away for the big one. I used the camera with different settings in order to capture the variation of the lights. We were very excited to see something like this. The first pictures were taken without the tripod, and since I was not stable, we captured different colours of the thing on the same picture. With the tripod, no zoom, the light seems white. But with the zoom at 40X, we got all kinds of pictures of different colours! Around 9h pm, I contacted my brother who leaves at about 30 km from our house, in Rivière-Rouge, QC. He could see the bright pulsating light too from his place! So it must have been big! 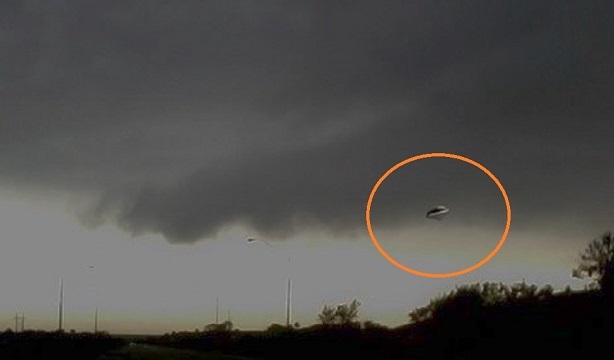 We are really curious to find out if you have a logical explanation to this or if this is a real UFO as we think it was. PS: I have selected only a few pictures to share. A mysterious insect-like creature that has been captured on film in several parts of the world but never physically and also not scientifically explained because of the tremendous speed at which it travels has also been found in Sabah. Called, among others, “flying rods”, “skyfish” and “solar entities”, these creatures are invisible to the naked eye and can only be noticed on slow motion camera and resemble a flying centipede. 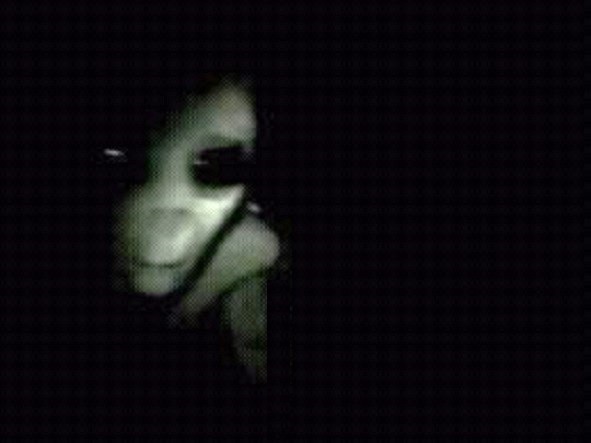 There are sceptics who still dismiss them as tricks of light or camera but other sceptics who have studied newer images of these so-called creatures have begun to acknowledge their existence although unable to pin them down as insects, a paranormal creation or even a possible alien life form. “We are very excited with our discovery and what this means to Sabah in terms of research in the new realm of cryptozoology or even UFOlogy given that their existence has stirred so much controversy and debate worldwide,” said Matthew Lazenby @ Jigger, an enterpreneur and avid traveller. The Sabah discovery was made two weeks ago by this British national who has a particular interest in cave systems and was indulging in his favourite pastime while on holiday here. He and a renowned local tour guide, John Nair, decided to get deep into an inaccessible cave using a helmet-mounted camera. ”We were surprised at what we found when reviewing the video,” said Matthew. “We did not know they were there until we reviewed the video footage. For obvious reasons we will not disclose the cave’s location until we have devised a sure-fire method of successfully trapping them on the next visit to this cave.” He explained: “The first thing we noticed were, of course, bats. But as we slowed down the speed we noticed what seemed to be like little specks that got bigger and bigger. “As we were going further and further into the cave, we noticed (upon slowing the film) more and more of these theoretical insects, since there is no official name given to them. “We don’t even know if they were an insect specie or creature of some sort that holds an element of intelligence that interacts with other entities or animal species,” Matthew said. What separates the Sabah footages from those taken elsewhere are the sheer abundance. “We even have footages of bats trying to avoid colliding with these creatures. Bats are never frightened of insects. “I have one footage of a group of them together and you can see them turning at extreme speed. They even chased a bat away. This bat was minding its own business until these rods appeared like it was terrified of them. “Also, previous footages, also using high speed cameras captured them in sparse environments. But our Sabah recordings show for the first time that these creatures have very powerful sensors that prevent them from smashing into the walls of the caves like making U-turns at the last moment. Insects can’t do this,” he said. “The way they move is nothing like we know in the animal or insect kingdom or even aircraft in terms of speed. It’s the fastest thing you have ever seen and can turn on a dine. 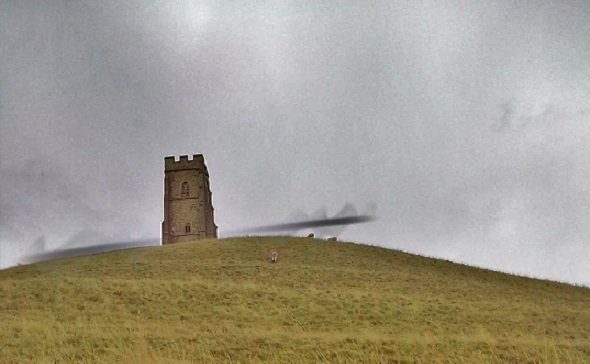 NOTE: The photo with the castle in the background was taken November 2010 in Glastonbury England. 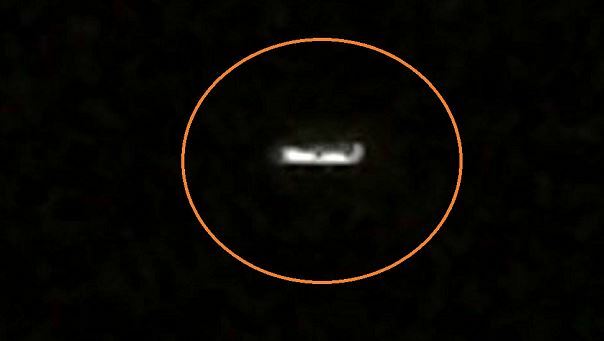 UFO Casebook image. A Pennsylvania witness at Erie reported watching two stationary lights in the sky that appeared to be sending vertical beams of light to the ground about 5:15 a.m. on December 6, 2012, according to testimony from the Mutual UFO Network (MUFON) witness reporting database. The witness was outside on a back porch when the first light was observed. “I noticed a very bright, pulsating horizontal object in the sky to the west,” the witness stated. “I saw an airplane to the southwest and knew it was not a plane. It was too big, too long.” The object appeared to be projecting a beam of light. “I could see it producing various beams- straight beams, and then it looked like it was creating a drawn star-like image.” Then a second and similar light was observed. “I looked to the northwest, more over Lake Erie, and there was another one – same patterns, except brighter.” The witness went inside to retrieve a pair of binoculars. Stepping back outside, the objects were still there. “They were still in the same place. The colors were red, blue, yellow, green. It was not a star, I scoped those out as well.” The witness moved away to alert other witnesses, but the objects were gone upon returning. “When I came back up at approximately 6 a.m. – they were both gone, but, the small stars that were not remotely as bright remained. These objects did not move. They remained in the same spot the whole time.” NOTE: The above image is a rendering. PLEASE HAVE A VERY MERRY CHRISTMAS MY FRIENDS….I WILL BE TAKING TWO DAYS OFF TO CELEBRATE THE BIRTH OF JESUS CHRIST………..THANKS FOR ALL YOUR SUPPORT THROUGHOUT 2012……. My friend and I were playing around in my back yard and he saw it first and told me to look up. When I did I saw just the bottom of it and it had 6 circles of mixed colors swirling around and a seventh circle in the middle of it doing the same thing. It must have have been the engines on it. It was about 1,000 feet in the air and it was heading north and it was a overcast night and I could see it clearly. I know what airplanes look like and helicopters look like and this was not either of them. It made no sound at all. And about 10 minutes later these 4 fighter jets came streaking over going the same direction as the UFO was going. I think that they were from Bainbridge Island, since that’s the only naval base around the Everett area. Then after about 15 minutes the fighter jets came back over where I was standing going back south from where it had come from. Since that time I’ve been a believer in UFOs and have read several books on the subject. I wish back in 1968 there would have been the internet so I could have told somebody about it back then. To this day I really don’t say too much about it because people may think I’m crazy, but I do believe in them. Now where them come from who knows? NOTE: The above image is a rendering. At @ 5:00 am on 24 November 2012 I was looking through the 2nd. fl. family room window of my residence admiring the clear blueish early morning sky with a few white clouds, and the fully lighted Empire State Building at a distance, probably getting ready for the daily working routines, when all of a sudden I noticed what appear to be a big circular/round “plate” formation of bright colored lights cruising the sky. It was coming from the New York City direction, from my left to the right, passing at eye level towards the area where I was. The lights were not speeding nor where they moving slowly, mainly the peculiar sight was traveling on what appeared to be a constant straight path motion. There where stars above it. It was not a star. I have observed airplanes go by from a nearby airport. It was not an airplane. There where beam lights around the city in support of Sandys victims. These where not beam lights. 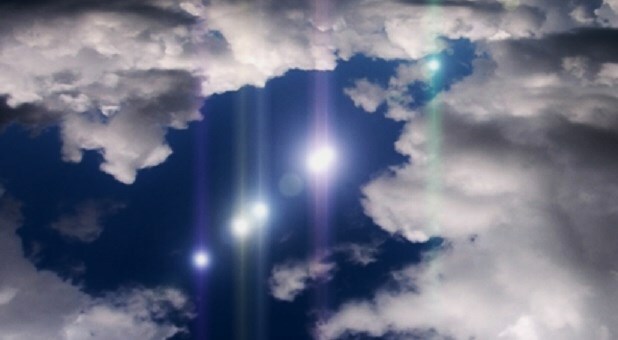 I witnessed the most beautiful and unusual lights I have ever seen “adorning” our early morning skies. The size is unknown to me but from my perspective it seems they were as big as my garage door, at a distance. No noticeable edge indicative of “a circular unknown flying machine” was observed. There was no outward reflection or beam light coming out. There were no pulsating lights, either. There was no clockwise movement to the left or right. It was a “plate” full of colored lights-red, yellow, orange come to mind-flashing constantly without moving around. It happen fast, not lasting more than a minute. There was no time for me to call upon my sleeping children. No time to get my cell and take a picture. It was a sight to be admired, enjoyed, while wondering, what if? Personally, I am a bias witness because I do not discard the possibility of unknown phenomena and mysteries in our great world and beyond. In the past, I have witnessed other unexplainable events that I have kept to myself. However, this time I feel it would be nice to share my experience with others. When I first saw these lights, nothing to the effect of “UFO” went through my mind. I just could not make sense of what it was, where it was coming from, where it was going…and who was “guiding” or “piloting” it. I did not deviate my eyes from the lights and followed them until they disappear beyond my eyesight. I just could not move from that window. I did not wanted to miss anything, for that matter. The stars where there to greed me, as a reassurance that I was indeed seeing something beautiful, unexplainable, unknown, something for me to recall as a true witness of this incredible and amazing event. Within a few hours I shared my experience with my children, they remained a little bit skeptical until I look up UFO sightings in NYC on that same date and showed them other individuals sightings around the early morning of that unforgettable 24 November 2012 morning! NOTE: The above image is a rendering. A friend and I had decided to have a small fire at a place called Farmers Beach. It is down a gravel road and sits right next to the lake of Clear Lake. 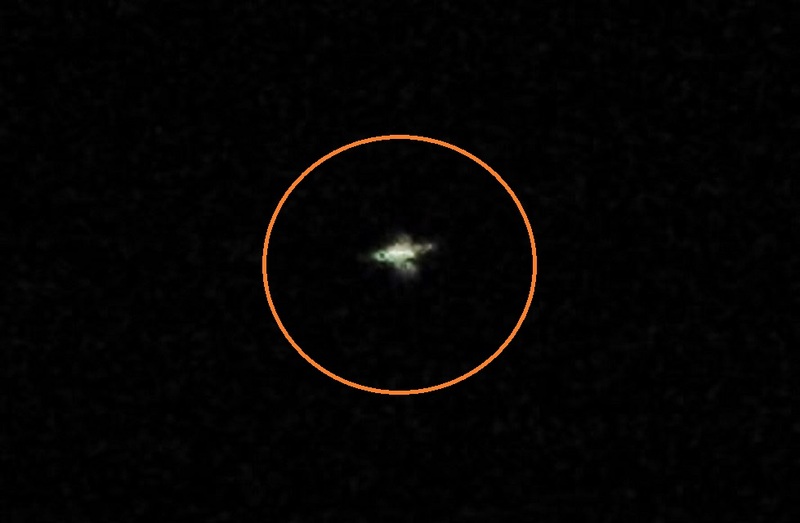 I happened to bring some binoculars and my camera because the last time we were there, we saw 4 other UFOs. We arrived at Farmers Beach to find that we had the place to ourselves at around 8:20 (estimated)and started a fire. It was a somewhat clear night but the stars weren’t as visible as they usually are. At around 8:45 I looked up towards the south to see a few glowing lights moving, one of them being blue. I quickly grabbed my binoculars to check it out. The objects were miles away and when I looked at the object it appeared to be a moving white light with a blue glowing trail behind it. Immediately excited I grabbed my camera and snapped my first picture at 8:55. In the picture were three white odd shaped objects that were somewhat in a triangle pattern. I was very intrigued by them since I had three on one picture, they have a somewhat cross like shape to them. At 9:01 I snapped another one. This one is eery and sends chills up and down my spine. The details that I am describing are coming from my camera as the naked eye would have just seen lights and shrugged it off possibly. 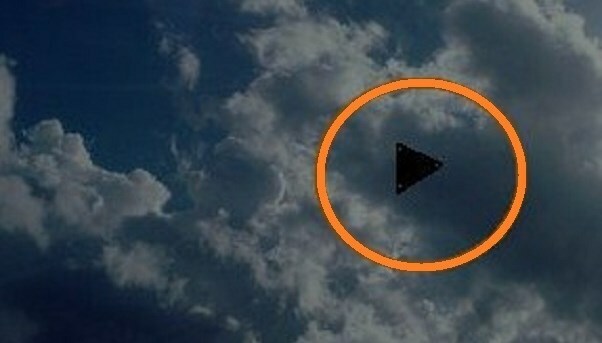 When zoomed in on this picture, it almost appears to be a plane. Within the next minute it just disappeared and I do not know how. After this, I just started snapping pictures in the direction that I saw these objects in the sky in hopes to catch something. 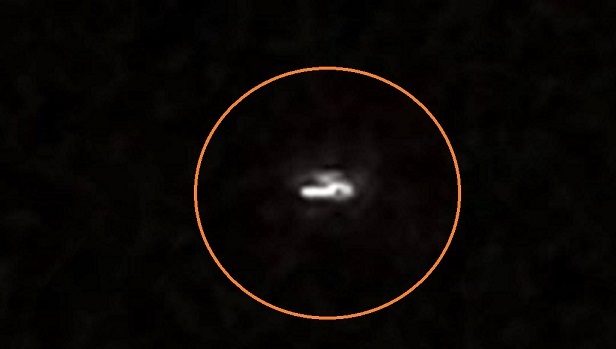 At 9:08 I caught what looks to be an object with three lights, one in front and on each side. 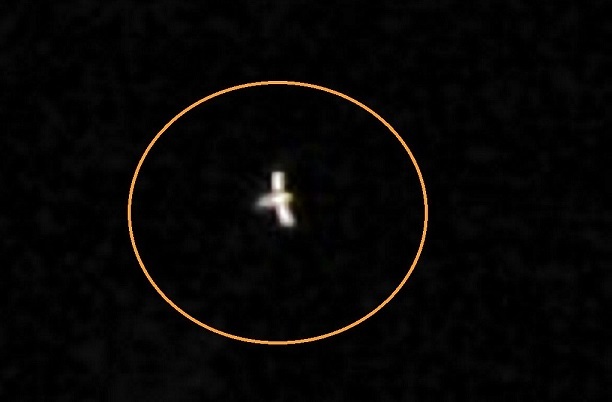 This object was being followed by a small white orb. These orbs have shown up by these objects in almost all of my pictures. Eight minutes later, I had a picture with 7 similar glowing white, cigar like shapes. One of them almost looks like a space shuttle with an orangish glow emitting from the bottom. The weirdest one in this photo has a vertical glowing white light along with a horizontal one towards the bottom of the object, almost like an upside down lowercase t. When I zoom in, this object also has a blue and sort of orangeish light on it, exactly diagonal from each other. The friend that I was with witnessed it all happening too, although he was more interested in the fire. My pictures speak more than my words as these are hard to describe. The objects were in the sky for maybe thirty minutes, I cannot explain how they appeared and disappeared, they just did. NOTE: After viewing the photos that the witness did submit to MUFON, I found the one above to be the best photo submitted. Very strange craft. Fly fishing on the Musconetcong River in New Jersey with my boss, I saw briefly what I could only describe as “a Praying Mantis Man”. Although the water was clear, there had been heavy rains the past couple of days. We should not have been out there; the river was “smooth” but the current was exceptionally strong. I was leaning backwards and digging my heels into the the gravel but the river was still kicking me along pretty good. Sketchy navigating. Please know, I am “privy to the paranormal” and always have been. Shadow people, ghosts, whatever. But what I encountered that day was not Spirit. It was a “biological”, living creature. But it disappeared into thin air almost as soon as I saw it. For whatever reason, my searches at the time turned up nothing. But then by chance I came across an ‘Alien Race’ type video on Youtube and there in the artwork I saw what I saw: “Ancient Mantis Leaders”. So when I began searching “Mantis Alien” instead of “Praying Mantis Man”, I found a lot more. Humanoid. Tall. 6 foot at least –no reference points– but I sense 6’6″ – 7′. Moving away from me back up the bank. (I am chest-high in the river) The first thing I see was the ‘grasshopper’ thigh, but bending forward like a human. Then the whole form. He is looking at me over his shoulder, moving up the bank, astonished, amazed. What, that I am in the water in a strong current, that I can see him? But yes we lock eyes and this creature is astonished– I get the sense that he can’t believe I am in the water, that he can’t believe I have seen him, that I am not perturbed at all– something of all three, I still don’t know– just astonishment and he is actually trying to get away from me and the water! No, I did not tell my boss about this, who was in the water too about fifty yards behind me at the time. Being “privy to the paranormal” you just see these things and sort of go “okay”. No fear, no nothing– but I do get the sense that my “whatever” attitude contributed to this creature’s astonishment. Frankly, I didn’t give the encounter much though until recently. I can forward more details. I just believe now that this encounter was somehow very important. NOTE: The above image is a rendering. Mexican experts found a cemetery a few thousand years old in the state of Sonora that has features never seen before in that region and extending the zone of influence of the Mesoamerican peoples, said archaeologists from the Institute National Anthropology and History (INAH). 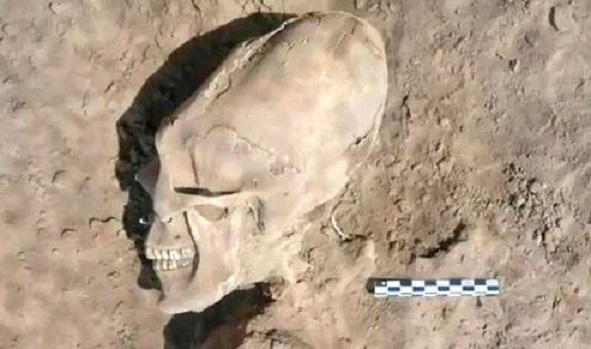 A mere 300 meters from the village of Onavas, southern Sonora, was an outdoor grave site, the first pre-Hispanic cemetery,of that state found with burials composed of 25 individuals, 13 of whom have intentional skull deformation, INAH said in a statement. For archaeologists, the discovery is relevant evidence of practices that were not recorded in the old Sonora cultural groups: cranial deformation (frontal occipital) was applied to 13 individuals, and modification by the wear of the side of teeth to give them a “V”. Garcia, director of the research project, which is conducted by Arizona State University, USA, with approval of the INAH Archaeology Council, said: “With this discovery extends the limit of influence of Mesoamerican peoples farther north: than had been recorded archeology” by previous archaeological finds. According to historical sources, the site must have belonged to the old Pima Indians, the region’s cultural group whose descendants moved to what is now the Sonora-Chihuahua state line, and could be part of a settlement located in the area of traffic that followed the western coastal towns in the southwest U.S. which traded in turquoise. “And in that transition, the Pimas adopted new traditions from Mesoamerica,” he explained, adding that the datings performed on human remains Epiclassic match the Mesoamerican period (900-1200 AD). It all began on the evening of January 3, 1979, when Cardenas was in his gift shop in Hialeah, Florida, and received a phone call from his friend, Fernando Marti. Marti asked Cardenas to accompany him to buy a pig from the local merchants to roast the next Sunday. Marti and his wife and daughter arrived at Cardenas’ place of business and they set out on their errand. After stopping at two different farms, they were still unable to find an acceptable ‘puerco” for their feast. As they continued their drive, they turned off onto a rural road that was in poor condition. At that point, the car began to lose power. The two men examined the engine but were unable to see what the problem was. Then the engine began to reflect red and violet lights in sequence. At the same moment, they heard a strange noise, like a swarm of bees. Next the car began to shake, and Marti’s wife began to scream in panic, believing it was an earthquake. When Cardenas tried to approach her to calm her down, he became paralyzed, frozen under the hood of the car. Then the same force that had paralyzed him began to lift him and suspend him in the air. Cardenas began to shout, “Don’t take me! Don’t take me!” The noise and lights ceased and everything seemed to return to normal. Then Marti looked up and saw a UFO ascending into the sky. He shouted, “They have taken Filiberto!” After several attempts, he was able to start the car. He felt compelled to tell the police, but feared he would not be believed, or worse, that he would be accused of having himself harmed Cardenas. He decided to inform the police anyway and also called Cardenas’ wife, saying, “A light took Filiberto away.” Meanwhile, Cardenas awoke onboard the UFO, in a seat that seemed to hold him in place by some kind of suction and restrained all his movements. He saw three strange figures, one of whom placed a strange helmet on his head and spoke to him in a language he thought sounded like German. He was shown projected images, as on a television, of scenes from the past, present and future of humankind. He was then taken to a smaller ship that discharged from the mother-ship. He saw a beach approaching, and then the UFO plunged into the sea. Everything was obscured by the incredible velocity at which the ship moved. The ship veered to the right and began to lose speed. Cardenas could now see a tunnel with walls that seemed illuminated as if they were phosphorescent. The ship entered the tunnel and then emerged in a place that was completely dry. The area was huge. He noticed two symbols, one of them being a serpent as large as “an electric light pole,” Cardenas later said. The other image was similar but smaller. His captors took him from the ship and told him to sit down on a large rock. At this point, one must note the similarity to what happened to Betty Andreasson Luca. 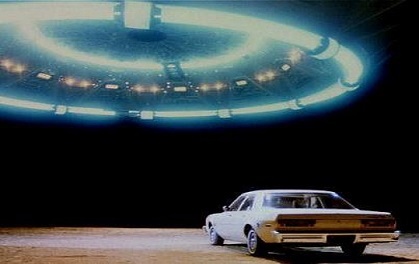 As with Luca, the UFO that transported Cardenas quickly plunged into the sea and emerged in a dry alien environment. While in Luca’s case the surroundings were icy, it is still remarkably similar to the large cave to which Cardenas was taken. NOTE: The above image is a rendering. On Tuesday, November 20, 2012, late afternoon (between 4:00 and 5:00 p.m. EST), while in the parking lot of a grocery store, I looked up in the clear sky at the moon. I saw a bright point-sized object moving near the moon. I thought it was odd that it was not leaving a contrail, so I took out my camera and took several pictures at maximum optical zoom (5x). I estimate the moon was at azimuth 90 degrees and altitude 70 degrees. It took the object about 2 minutes to transit the sky. It was at about azimuth 0 degrees and altitude 15 degrees when it moved behind some trees and I lost sight of it. The object made no sound. Considering its size and appearance through my camera at 5x zoom, I would guestimate its height to be jetliner height, size unknown but it had to be large and distant. The object was solid with three sections: a glowing section to the left, a glowing section to the right, and a vertical section rising up where the other two joined, like a dragonfly shape. The glowing sections glowed with a brilliant white light with yellowish-orange or yellowish-red around the edges. I saw no other objects or aircraft in the sky. My son and his uncle was outside watching shooting stars. 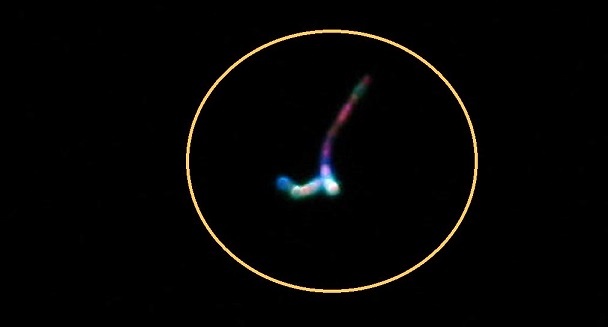 All of a sudden this object appeared out of no where with no tail (like a shooting star should have) and was quite brighter than anything they had seen. It went in a sharp NE direction stopped and hovered at this point my son began to take pictures with his iPhone. The object changed direction backwards. Then it hovered again for aprox 1 minute and the shot off this time leaving a u shaped cloud. My son, terrified, called me at work. He is 11. I told him to send me the picture thinking it was a shooting star and I could let him know it was okay. After seeing the pictures and realizing there was no way he could have got so many pictures of a moving star I realized it may be something else. The cloud of smoke left clearly looks like it was going back into space. I am (was) a non believer but these photos are sure strange. Dmitry Anatolyevich Medvedev is the tenth and current Prime Minister of Russia, incumbent since 2012. He previously served as the third President of Russia, from 2008 to 2012. At the age of 43, he was the youngest Russian President. 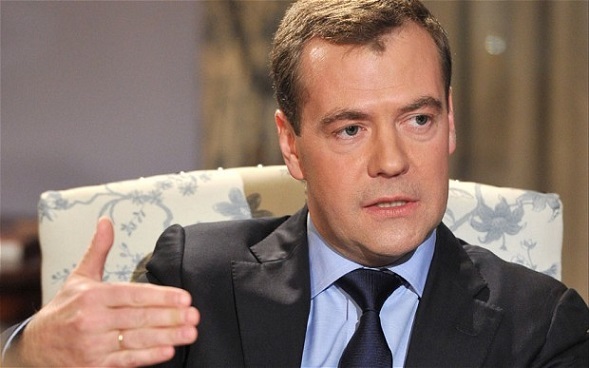 Medvedev said there are top secret files on aliens that have landed in Russia. Staggering off the air Dmitri Medvedev comment confirms aliens are here.. After the recording of a television program, the Prime Minister of the Russian Federation did not realize that his microphone was still open and let go of the statements that stunned journalists and professionals in the studio: “I believe in Santa Claus, but not too much, “Medvedev began, but then continued: “Aliens .. I can not tell you how many of them are among us at this time, otherwise it would trigger panic. At 5:00 am I was looking through the 2nd floor family room window of my residence admiring the clear blueish early morning sky with a few white clouds and the fully lighted Empire State Building at a distance, probably getting ready for the daily working routines, when all of a sudden I noticed what appeared to be a big circular/round “plate” formation of bright colored lights cruising the sky. It was coming from the New York City direction, from my left to the right, passing at eye level towards the area where I was. The lights were not speeding nor where they moving slowly, mainly the peculiar sight was traveling on what appeared to be a constant straight path motion. There where stars above it. It was not a star. I have observed airplanes go by from a nearby airport. It was not an airplane. There where beam lights around the city in support of Sandys victims. These where not beam lights. I witnessed the most beautiful and unusual lights I have ever seen “adorning” our early morning skies. The size is unknown to me but from my perspective it seems they were as big as my garage door, at a distance. 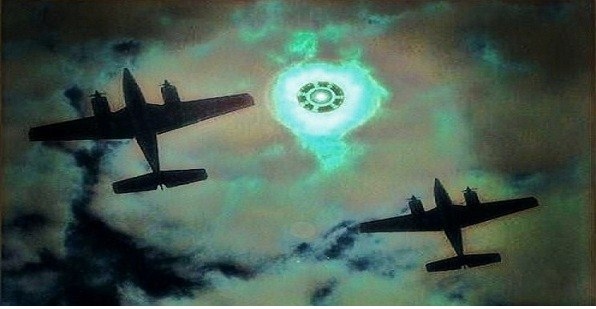 No noticeable edge indicative of “a circular unknown flying machine” was observed. There was no outward reflection or beam light coming out. There were no pulsating lights, either. There was no clockwise movement to the left or right. It was a “plate” full of colored lights-red, yellow, orange come to mind-flashing constantly without moving around. It happen fast, not lasting more than a minute. There was no time for me to call upon my sleeping children. No time to get my cell and take a picture. It was a sight to be admired, enjoyed, while wondering, what if? Personally, I am a bias witness because I do not discard the possibility of unknown phenomena and mysteries in our great world and beyond. In the past, I have witnessed other unexplainable events that I have kept to myself. However, this time I feel it would be nice to share my experience with others. When I first saw these lights, nothing to the effect of “UFO” went through my mind. I just could not make sense of what it was, where it was coming from, where it was going…and who was “guiding” or “piloting” it. I did not deviate my eyes from the lights and followed them until they disappear beyond my eyesight. I just could not move from that window. I did not wanted to miss anything, for that matter. The stars where there to greet me, as a reassurance that I was indeed seeing something beautiful, unexplainable, unknown, something for me to recall as a true witness of this incredible and amazing event. Within a few hours I shared my experience with my children, they remained a little bit skeptical until I look up UFO sightings in NYC on that same date and showed them other individuals sightings around the early morning of that unforgettable morning! NOTE: The above image is a rendering. I was driving north along U.S. highway 1 , just north of Rockingham Dragway. It was completely dark, with no moon apparent. The skies were not bright but all manner of stars were visable. I looked up at the sky and a group of stars seemed to just disappear. As I was driving, I could not quite tell what I was seeing, so I pulled off the road into the parking lot of a gasoline station at the intersection of US1 and NC Highway 177. I stopped my vehicle and turned off my lights and engine. I stepped out of my truck and could see a black triangular shapped craft moving slowly to the northeast. It was nearly invisible as no lights or anything else was visable. It was easier to track by watching stars become invisible and then reappear as the craft passed by. Judging size with any accuracy was not possible but it appeared tremendously large, large enough that I felt it impossible that anything that large could fly. I watched it for a couple of minutes as cars came by on the highway their headlights made it difficult to track. I restarted my vehicle and continued north. I stopped again in the vicinity of Hoffman N.C., approximately 5 miles farther north, I was able to watch it again for a couple of more minutes until it seemed to be in the vacinity of Camp Mackall, a U.S. Army training facility associated with Ft. Bragg. There is a large rotating beacon there. I guess for the airfield there and I couldn’t see the object any more after it got in the vacinity of it. I love aviation and I can identify nearly every type of aircraft I see but this was unlike anything I had ever seen. I was not afraid but I was quite unnerved by what I saw. I would truly love to know what I saw that night. NOTE: The above image is a rendering.